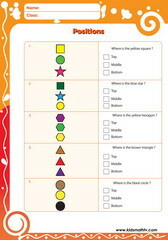 Math worksheets on teaching children positions and spatial sense. 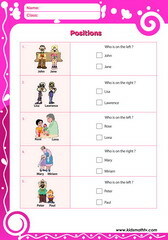 Children from pre - kindergarten to 6th grade can test their skills on the topic in areas like: coordinate graphs, positions in space like left, right, middle, top, bottom, central right, central left etc. positions in x,y - coordinates and more. 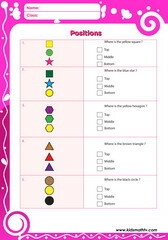 Each worksheet has an answer key and in being PDF means as many can be printed without restriction for use at school and at home. Also watch relevant videos and play games on the site. 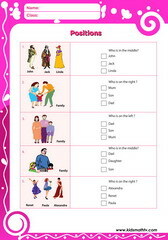 Practice Locate in a 3 by 3 grid 2 with this worksheet. 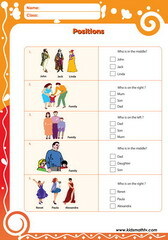 Practice Inside and outside positions worksheet with this worksheet. 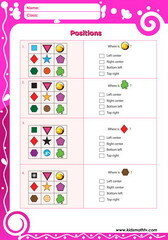 Practice Left right middle positions worksheet with this worksheet. Practice Left right positions worksheet with this worksheet. 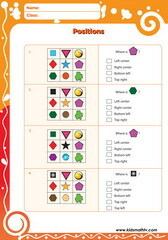 Practice Locate in a 3 by 3 grid worksheet with this worksheet. 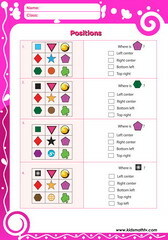 Practice Locate in a 3 by 3 grid worksheet 2 with this worksheet. 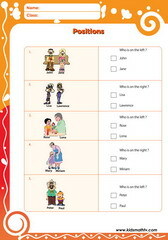 Practice Top bottom middle positions worksheet with this worksheet.